ST. GEORGE — Another “First Friday” event is on its way this weekend and things are (pumpkin) spiced up with a fresh lineup of performers and festivities centering on Oktoberfest, the German fall festival. New for October is expansion of George, Streetfest on Main to Tabernacle Street with special entertainment for teenagers. While Oktoberfest hasn’t traditionally been celebrated in Southern Utah, Melynda Thorpe of Emceesquare Media & Events and presenter of the streetfest, said, the organizers saw this month as an opportunity to celebrate German culture, particularly the German pioneers who helped settle the city. 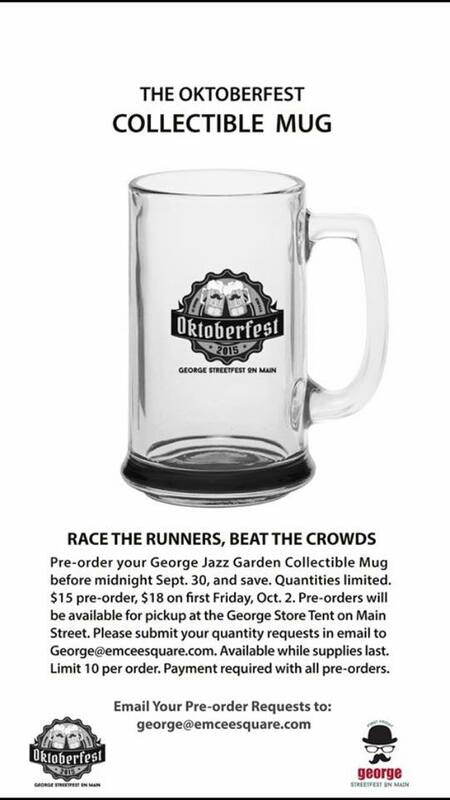 Collectible Oktoberfest mugs will be available at the event, with root beer on Main Street and beer at the Jazz Garden. Purchase of a mug comes with the first fill free. Pre-order requests can be made until Sept. 30 by emailing george@emceesquare.com. See inset right for details. Main Street and Jazz Garden food vendors will compete in a bratwurst competition with customers determining the Oktoberfest 2015 Brat Champ. 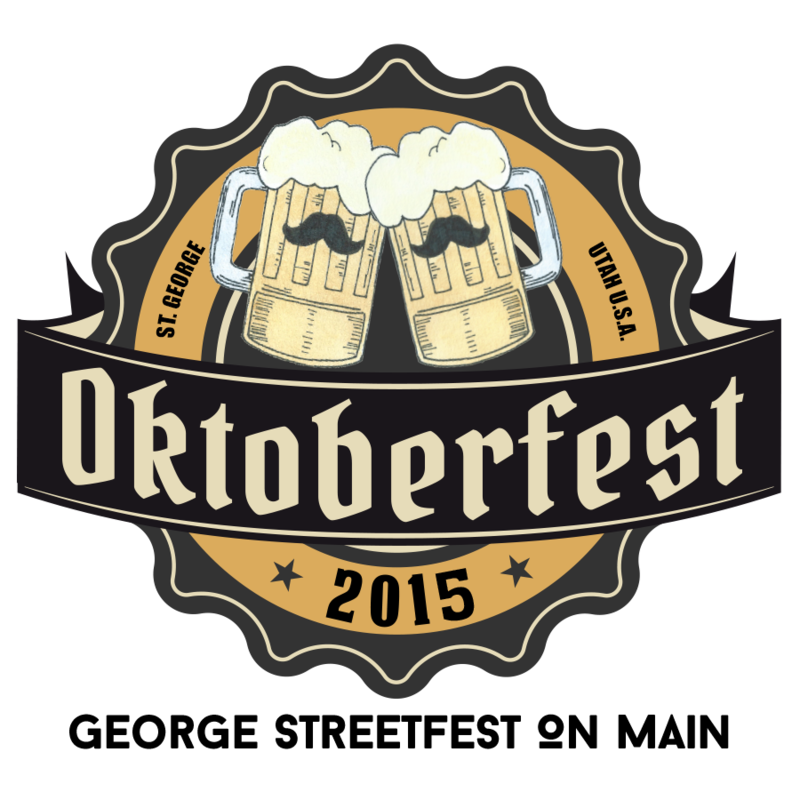 We are excited to celebrate Oktoberfest this month with blues, bratwurst, beer and root beer,” Thorpe said. The free Precision Hearing Main Street Concert will feature entertainers singing the blues, including Southern Utah blues musician Tom Bennett and The Katt’s Pajamas, of St. George. 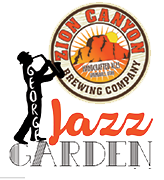 Chiming in at the Jazz Garden will be one-man blues guitarist, singer and harmonica player Nic Chamberlain, of Southern Utah. Musical duet Russ and Rebecca Burt, of Las Vegas, will perform European Jazz at 7 p.m., including yodeling and clarinet, accordion, banjo and bass. West Coast Jazz follows at 8 p.m. with jazz sax virtuoso Russ Burt on tenor sax and Nic Chamberlain on electric blues guitar. This final two-hour set will include cool jazz, Chicago-style blues and Rebecca Burt’s vocal jazz ballads. An extremely popular event, George, Streetfest on the first Friday of every month gathers up to 5,000 attendees, Thorpe said, so this month, the activities are wrapping around the corner onto Tabernacle Street to the Electric Theater. The expansion is partly due to an increasing call for more activities for teenagers, and there will be a disc jockey performing for the youth on Tabernacle Street, Thorpe said. The plan is to eventually have a rock wall and more activities, but the DJ is the first step. 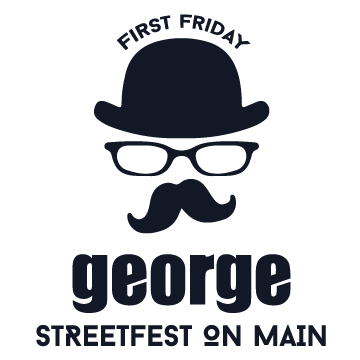 George, Streetfest on Main – shall the “First Friday” events continue? George, Streetfest on Main has been a popular summer activity, but autumn’s arrival doesn’t mean the nightlife is ending. The “First Friday” events were originally contracted in June for six months, Thorpe said, but in November, Streetfest planners will distribute surveys about the event. Those who take the survey s will have the opportunity to decide whether that contract is renewed. If the people vote for the Streetfest to continue, it will continue until around the same time in 2016, when the contract will be up for renewal again. “As long as the community wants the Streetfest, we’ll have it,” Thorpe said. Event partners are the City of St. George, St. George Area Convention and Visitors Bureau and Historic Downtown Merchants. Additional sponsors are Canyon Media, St. George News, Etched Magazine, The Independent, Richens Eye Center, Zion Brewing Company, Simister Orthodontics, Precision Hearing, Wingate by Wyndham Hotel and the Habitat for Humanity Restore. For more information, or to apply to be a street vendor for the Nov. 6 event, visit the George, Streetfest on Main website. Vendor deadline is two weeks before each first Friday event. For sponsorship opportunities, contact Melynda Thorpe by email. When: Friday, Oct. 2, 6-10 p.m.
Beer? Dancing? St. George? Naw, I don’t believe it. Can’t happen in this Town. I will go and check it out but I’m pretty sure that the cops will keep things buttoned down pretty tight. Oom Pah Pah, should be a rip roaring event. Well before I give my yes or no for the show. I will wait and see how many people get arrested for public intoxication. you can bet there will be more cops there than people drinking beer. Can’t wait to see my nephew play tonight! Jordan Young rocked last night! Quite a performance.